The Mexican Jays (Aphelocoma ultramarina) - also sometimes referred to as Grey-breasted Jays - occur naturally in the Sierra Madre Oriental and Sierra Madre Occidental mountain ranges (from southwestern USA south into Mexico). Until recently, it included the southern Transvolcanic Jays (Aphelocoma ultramarina) named for their home range - theTransvolcanic Belt. These birds live in complex and tight social groups that may include multiple breeding pairs that are assisted by several non-breeding nest helpers. The range of the Mexican Jays stretches from central and eastern Arizona, southwestern New Mexico and west-central Texas south through the eastern central mountain chain south to Puebla, Guerrero and central Veracruz and went to Jalisco and Colima. They occur at elevations ranging from ~ 3,940 - 5,900 feet (1,200 - 1800 meters). Their preferred habitats are montane pink-oak forests. These sedentary birds remain year-around in their breeding territories. In May 2011, the American Ornithologists' Union voted to elevate theTransvolcanic Jay to species level based on genetic distance. Range: Mountains of westernMexico, from southeasternSonoraand southwestern Chihuahua southin Sierra Madre Occidental to western Zacatecas and northern Jalisco. ID: Smallest of the Western races with distinct, high-pitched vocalizations. Range: Mountains of southeastern Arizona and southwestern New Mexico south to northern Mexico (northernSonora and northwestern Chihuahua. ID: Large. Most pale plumage of all races. Range: Chicos Mountains of extreme southwestern Texas south in Sierra Madre Oriental to southernNuevo León and northern San Luis Potosí. ID: True blue plumage details. Juveniles have all-black bills; except the roof of the inner upper bill remains whitish for up to two years. Blue head, wings, rump and tail. Pale grey chest and underparts. 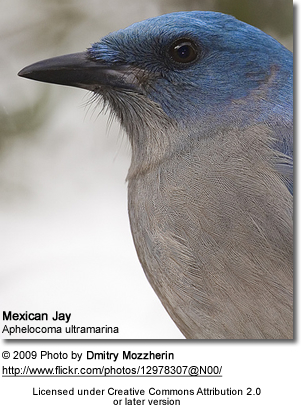 The Western Scrub-Jay has an unstreaked, plain throat and chest. The back is greyish- brown. It has ablue necklace across the chest, and a white line over each eye. There is some overlap in their ranges. 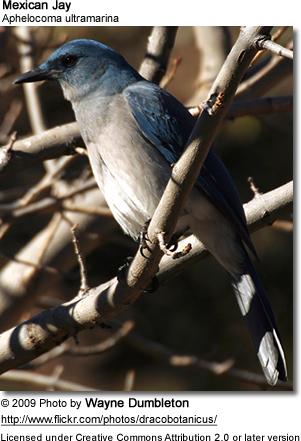 The Pinyon Jay can be identified by theshort tail,blue chest andlong, pointed bill. Their varied diet includes both plant and animal matter. 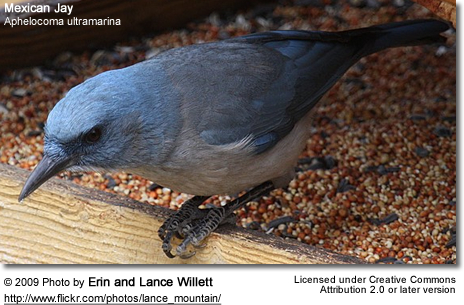 They feed on acorns, pine nuts, insects, small reptiles, and - on occasion - the eggs and nestlings of other birds. During the winter, they rely on pine nuts and acorns harvested and storedin the autumn. Mexican Jays breed in social groups that include one or two breeding pairs and two or more"helpers. "These nest helpers are typically related (offspring of the dominant breeding pair), but may also include unrelated flock members. These groups most commonly include 5 to 25 birds andmay produce several active nests. Most sources report that the Mexican Jays are monogamous; however, extra-pair copulations have been noted in both males and females, and the majority of nests contain offspring sired by different males - which often are members of the same social group. Most nesting activities occur between late March to mid-April. Unpaired males start to construct nests and then perform a nuptial display to attract the attention of unpaired females in their group. The courtship display includes circling around the female with the male's tail up. He may spread his wings and call to her with his “whisper” song. If the female is receptive, she will allow him to mount her. The copulation is short, only lasting one to five seconds. Once mating has occurred, she will take over the construction of the nest, while the male guards the nest site. The open cup nests are usually placed in trees and are constructed out of twigs and rootlets, and lined with soft plant fibers. The helpers are not involved in nest construction and brooding of the eggs and young, but will guard the breeding territory, mop intruders, warn nesting pairs of any dangers and most (but not all) will help feed the young. A clutch consists of 1 -6 eggs (mostly 4 or 5) that range in color from pale green to pale blue. Eggs may bemarked or unmarked. The female alone incubatesthe eggs for about 17 - 18 days. The incubation usually starts after the third (or the next to last) egghas been laid. The male and male nest helpers bring food to the brooding female. The hatchlings lack any feathers and their eyes are closed; initially they weigh as little as 0.2 oz (6 g). The nesting pair and helpers feed them insects for the most part, and some acorn pieces. Close to fledging, these birds can weigh as much as 3.6 oz (100 g). The young fledge (leave the nest) when they are 24 - 28 days old. If conditions are suitable, second or even third clutches may be produced. However, many times these are replacement clutches, produced when the previous clutches were lost or destroyed. 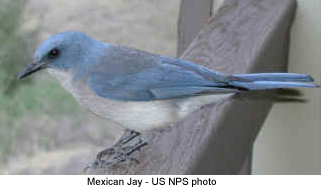 Mexican Jays have been reported to reach 21 years or more.